Friend Connect follows plans announced last week by the world's two biggest social networking sites, MySpace and Facebook. Data Availability and Connect let users move their personal profiles and applications to other websites. 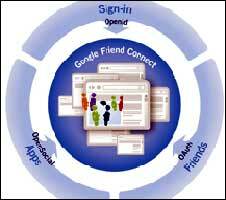 "Social is in the air," says Google's director of engineering David Glazer. During a conference call at Google's California headquarters, Mr Glazer told reporters: "Google Friend Connect is about being the 'long tail' of sites becoming more social." "Many sites aren't explicitly social and don't necessarily want to be social networks, but they still benefit from letting their visitors interact with each other. That used to be hard." Charlene Li, principal analyst at Forrester, told BBC News: "Google is tapping into the 'all things social' heat of the moment, but it's adding a different perspective, not as a data source and social network 'owner' but as an enabler." At the heart of Google's service is the use of Open Social which will allow third parties to build and develop applications for the site. The company says with Friend Connect, any website owner can add a snippet of code to his or her site and get social features up and running right away without any complicated programming. This will run the gamut from invitations to member's gallery and from message walls to reviews. In an example of how it will all work, Google cited fans of independent musician Ingrid Michaelson who can now connect with other fans without having to leave the site. Visitors will be able to see comments by friends from their social networks, add music to their profiles and see who is attending concerts all at Ingrid's website. "Social networking is going mainstream. It used to be proprietary, but now it's going to be open and baked into the infrastructure of the net, not just one site or one source," says Mr Glazer. MySpace was first out of the gate when it announced plans last Thursday to loosen its grip on the estimated 200 million personal profiles its users store on its site. Data Availability will allow members to share select information with four partners, Yahoo. PhotoBucket, Twitter and eBay. Essentially the user will still be tied to MySpace which aims to put itself at the centre of the web by encouraging users to store all of their core data at the site to begin with. One day later Facebook entered the fray with a service called Connect. With its 70 million users worldwide, their plans differ from MySpace by allowing users to take their personal profiles to any website that wants to host them and not just the sites that have partnered up. So what's driving this move to dismantle the so-called "walled garden" where social networking sites have jealously guarded their users profiles? Charlene Li, principal analyst at Forrester told BBC News in the end it all comes down to money. "It's a smart move by Google which is trying to play the role of United Nations secretary general by making sure everyone talks nicely to one another, getting the data to where they want to move it back and forward, and participate in open standards. "Remember Google doesn't do anything without thinking about, not only how can this benefit the larger community, but how can it benefit Google." As 99% of sites are not currently socially enabled, Friend Connect has a big potential market in front of it and Ms Li says the route to all things profitable in this space will be through tapping into "the deep profit and user data flowing through Friend Connect." In other words, mining that information through advertising. Google is being cautious about approving sites to use the new code and is creating a waiting list for requests to use Friend Connect. It says it expects to give the go ahead to a few dozens sites in the next few days. As to opening out to a wider audience, Google says it estimates that will happen over the coming months. Meanwhile MySpace and Facebook anticipate rolling out their offerings over the next few weeks.